This walking tour provides the perfect contrast between coastal scenery and rugged mountains, offering character accommodation and traditional food along the way. Start on a spectacular journey from Scala di Santa Regina, an old mule path that leads into the central Niolu valley. The path will take you through an area of wonderful pine forests and tumbling mountain rivers plunging through a series of waterfalls to form perfect natural rock pools. 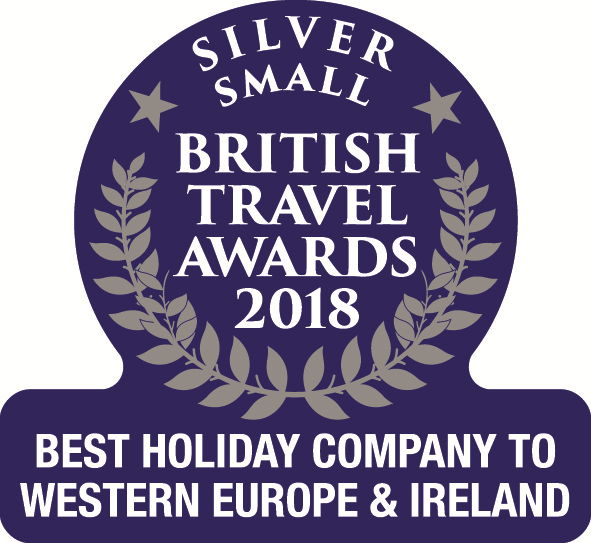 Once on the west coast, explore the small mountain villages, get accustomed to the rural Corsican way of life and drink-in the jaw-dropping scenery along the Spelunca gorge and Calanches de Piana. After arriving at Calvi or Bastia airport, you will be transferred to Corte for your first night. 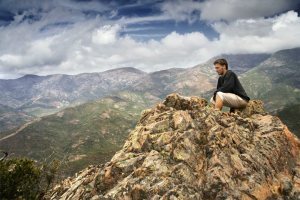 Corte was once the capital of Corsica, during the reign of the much fabled Pasquale Paoli, and the city does still hold quite a grandiose air about it - something only enhanced by the monumental mountain scenery that surrounds it. Enjoy an evening of relaxed dining in one of the local eateries and wander the cobbled streets of the citadel before returning to your base. Overnight: Hôtel Duc de Padoue (or similar) on bed and breakfast in Corte. You will be transferred to the start of your walk in the Scala di Santa Regina. This trail is of great historical importance because it’s the age old path that was used by shepherds leading their herds in and out of the Niolu valley. It leads up through a décor of granite cliffs along a superb balcony path to a small Genoese bridge - a lovely place to take a rest, have something to eat and perhaps a swim. The views open up and you continue on through a very different landscape: the granite cliffs giving way to old chestnut groves and rolling forest hills. You then walk down towards the lake in the base of the valley towards the village of Calacuccia where your overnight stop is situated on the outskirts of the village. Hôtel Acquaviva is run with a personal touch and is a comfortable country inn. You will be looked after in simple style and you can expect some fine cooking using the very best seasonal, local produce. Distance: 10km. Active walking time: 5 hours. Altitude gain: +700m. Descent: -340m. Overnight: Hôtel Acquaviva (or similar) on bed and breakfast and evening meal in Calacuccia. After a short 20 minute transfer, you will arrive in the vast Corsican pine tree forest, called the ‘Val-du-Niellu.’ We drop you off at a small camp that belongs to the Foreign Legion. A forest path leads uphill towards the Col de Vergio. The Laricio pine trees soar high above and are home to the famous ‘sitelle’ a little acrobatic bird. This nuthatch scurries headfirst down the trunks of the pines looking for insects in the bark. The Col de Vergio is a high mountain road pass, it is marked with a forbidding statue and is the boundary point between the island’s north and south departments. The views are majestic; the peaks are high and loom above. The trail goes downhill through the Aïtone pine forest to the outskirts of Evisa. You will pass the piscine naturelle, a big rock pool and local swim spot, then continue down through the chestnut woods that mark your approach to the village. Some of the thick gnarled old trunks have been standing here for nearly two thousand years. You will arrive in the centre of Evisa, situated at 830m altitude - it’s a vibrant mountain village with a healthy climate. It is unusually close to the sea for a village of this height and is known locally as ‘the pearl of the mountains’. The Hôtel Aïtone is run by Monsieur Ceccaldi and is full of Corsican character. It is well furnished and comfortable with mountain rusticity. There is also a swimming pool and sun terrace. From the restaurant you can watch the sunset over Porto; it is a beautiful sight. Distance, 11.5km. Active walking time, 5 hours. Altitude gain, +80m. Descent, -720m. Overnight: Hôtel Aitone 2* (or similar) in Evisa on a Half Board basis. Today you have the option of just relaxing, or taking a walk that follows part of the trail known as the ‘Mare e Monti’. It is a village to village walk, which in the old days was the only route of communication between the villages. It leads through the surrounding chestnut woods into a luxuriant maquis, a jumble of vegetation, a mix of oak, cistus flowers, strawberry tree, curry plant and tree heather. You will arrive at the abandoned hamlet of Tassu, a small treasure to investigate. Nearby is the village of Marignana, a good spot to stop for a coffee. A return walk via the village of Cristinacce completes the insight into rural village life. Distance: 9km. Active walking time: 5 hours. Altitude gain: +300m. Descent : -300m. An old path descends through the Spelunca gorge, zig-zagging back and forth into the depths. You will come to a high arched Genoese bridge. The path leads alongside the torrent, towards Ota. This is a village that couples mountain architecture with a hot Mediterranean climate and flora. Braying donkeys, hunting dogs, villagers working in their gardens, bright bougainvillaea, lemon and fig trees all add to the colour. The delicious smells from the Ceccaldi restaurant beckon, perhaps you will get tempted in... From the terrace you can see the succession of high pink hued sea cliffs not so far off now. Your route leaves Ota, heading swiftly down to the coast. The view towards the Gulf of Porto is a kaleidoscope of colour: red cliffs, a shock of blue sea and the bold silhouette of the Genoese tower. On your way downhill you can find all the plants that you associate with the heat and the Mediterranean: deep blue-black island lavender, pale pink cistus and rock sedum. Distance: 14km. Active walking time: 6 hours. Altitude gain: +320m. Descent: -1170m. Overnight: Hôtel Kallisté 3* (or similar) in Porto on a bed & breakfast basis. With just 4 and a half hours walking today you may choose to spend your morning in Porto to enjoy some of the sea activities. When the sea is calm there are regular boat trips towards Scandola, which is the most reputed part of the coastline: the wild natural beauty is spectacular. This dramatic coastline is classed by UNESCO as a site of world beauty. From Porto beach, it’s possible to explore on your own with snorkel and mask, or if you wish, there is scuba diving. If you decide to walk directly to Piana in the morning it is possible to walk down to the small sandy cove of Ficaghiola in the afternoon. Leaving Porto, you cross over the bridge that links the marina area to the harbour. The beach is bordered by a eucalyptus wood and the path is just above sea level giving a balcony view down onto the clear blue waters. There are splendid views of the indented rugged coastline and its many creeks. Depending on the season, you can find foxgloves, tall white asphodels and delicate wild cyclamen. Once in the ‘Calanques’ you will discover an incredible site of granite needles, tortured shapes and rock sculpted formations dotted with maritime pine trees. Distance: 12km. Active walking time: 4.5 hours. Altitude gain: +520m. Descent: -70m. Overnight: A sea view room at Hôtel Scandola 3* (or similar) in Piana on a bed & breakfast basis. From Piana a short taxi ride is arranged through the Calanques to Porto Bus Station. From Porto take the bus (pay for ticket locally, approximately 18€ per person) all the way to Calvi. Overnight: Calvi Hôtel (or similar) on bed and breakfast in Calvi. Your holiday comes to an end at your hotel after breakfast. 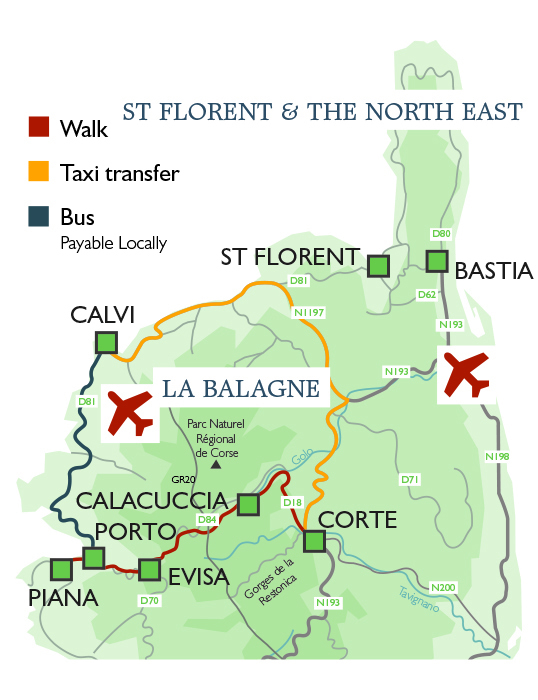 You will be collected from your hotel and taken to Calvi or Bastia airport. This is a very varied week of walking that takes in the mountainous interior, the coastline and the contrasts of this intriguing island. The walks are on good footpaths and trails although terrain is often rocky and rarely flat. You need to be used to walking all day and take regular exercise to enjoy this holiday. There are many uphill and downhill sections. We describe this walk as moderate with strenuous sections and encourage walkers to use two walking poles. The paths are well trodden and way- marked but you still have to be attentive to your maps. Sea view room upgrade at Roches Rouges available on request, and at a supplement. Exact tour accommodation may change depending on availability.